There are security chains and there are security chains! 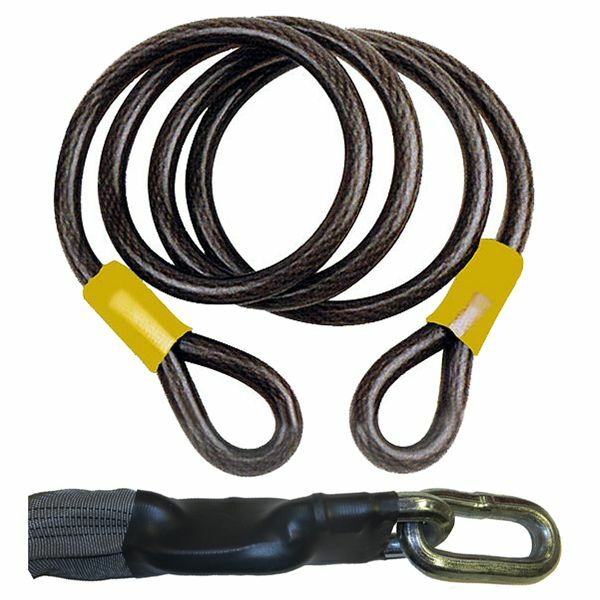 Here you`ll find security chains that have passed the highest security standards, some of which have even attained the coveted Sold Security Gold standard, like the Squire Ex-Caliber for example. So if you need a motorbike security chain or a chain to secure a valuable trailer, Quad Bike or piece of farm equipment, you`ll find just what you need right here. Mobile objects like motorcycles, motorscooters, bikes, lawnmowers and trailers are often not secured adequately so they can be very easy targets for thieves. Similarly, outdoor and garden equipment such as ladders, wheelie bins, garden furniture and barbecues can also be targeted by opportunist thieves. The way to prevent loss of your valued possessions is to implement appropriately rigorous security. One of the most important principles to keep in mind is that simply wrapping your motorbike or bicycle in a locked chain is not enough. You must secure it to an immovable object thus preventing thieves from simply stealing the item along with it`s security chain and lock. Remember that whatever security you put in place it is only ever as good as the weakest link. This might be the chain, the cable, the lock or the anchor point to which you attach it. Police guidelines recommend that you spend around 10 to 15% of an items value on its security. It`s not recommended that you secure a £5000 bike with a £50 lock. Always use the best security you can afford. 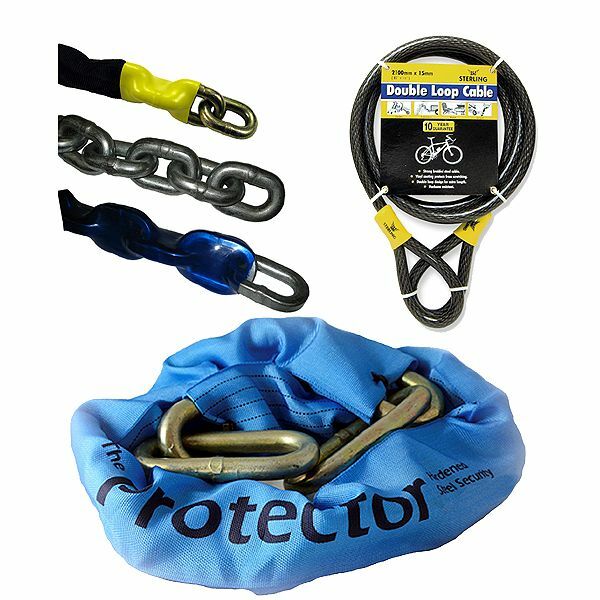 Our ranges of security cables and chains provide the perfect security solution for locking up valuable objects such as outdoor furniture, bikes, boats and trailers. When considering security chains there are four main attributes that determine the level of security provided: the diameter of the chain link section, whether the alloy steel links are welded, whether the links are case hardened and are they through hardened. Chains of 11mm and over in diameter with welded links and both case and through hardening offer the highest level of security. These are the chains to choose when securing expensive items such as motorcycles, motorscooters, caravans or trailiers. One of the negative aspects of these high security chains is that they can be heavy and cumbersome. This makes them inappropriate for many applications where lower levels of security might be adequate. This is where security cables can be very effective. These provide flexibility, allowing the cable to be woven around and through objects such as ladders, garden seating and barbecues. Couple your selected security chain or cable with the right padlock and anchor point and you will have massively improved the security of your valuable possessions. 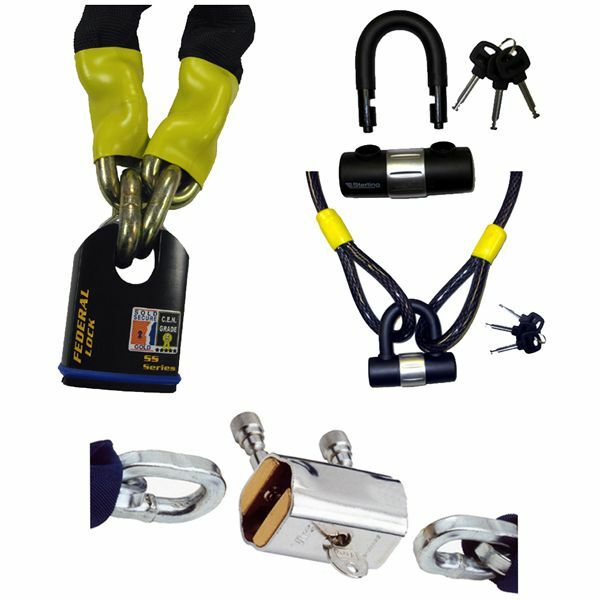 You`ll also find a range of security ground anchors and heavy duty padlocks which match the high security chains and cables perfectly..
...need help choosing a padlock to go with your chain? Here are some additional helpful pages that will ensure that you find the right security products for your needs. High Security Chains - What you need to know. Choosing a Security Chain - Read our sensible guide. 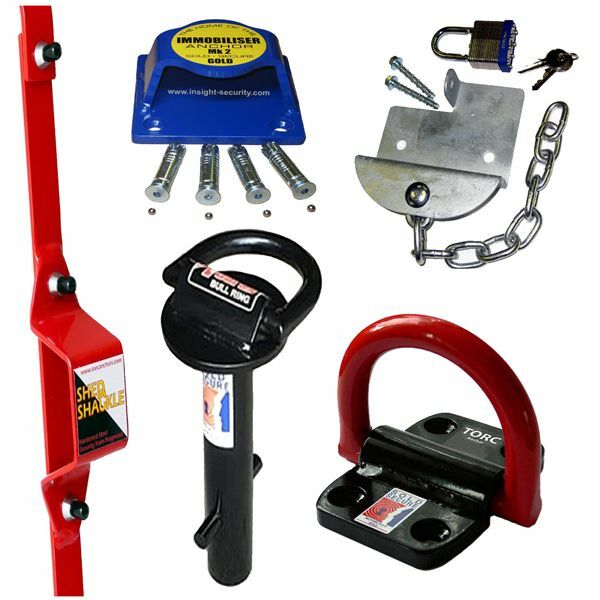 Protecting Bikes and Motorcycles - products that will help..
Our High Security `Sold Secure Gold` rated Chains, offer the ultimate, rugged protection for your Motor Cycles, ATV`s, Mobile Compressors, Ride on Mowers, and lots more.